Prayer is crucial to the well being of our community. Through prayer we open ourselves to the mystery of God's passionate devotion to us, which then floods us and takes root in our hearts. Through prayer we share with God the depths of our hopes and fears and great, great desire for God's dream to become a reality. Through prayer we acknowledge God as the giver of every good gift, the one whose holy light we seek to channel into this dark world. Through prayer, we become one body in Christ through the grace of the Holy Spirit.. Therefore, in addition to time, talent and treasure, we eagerly ask for your prayers. 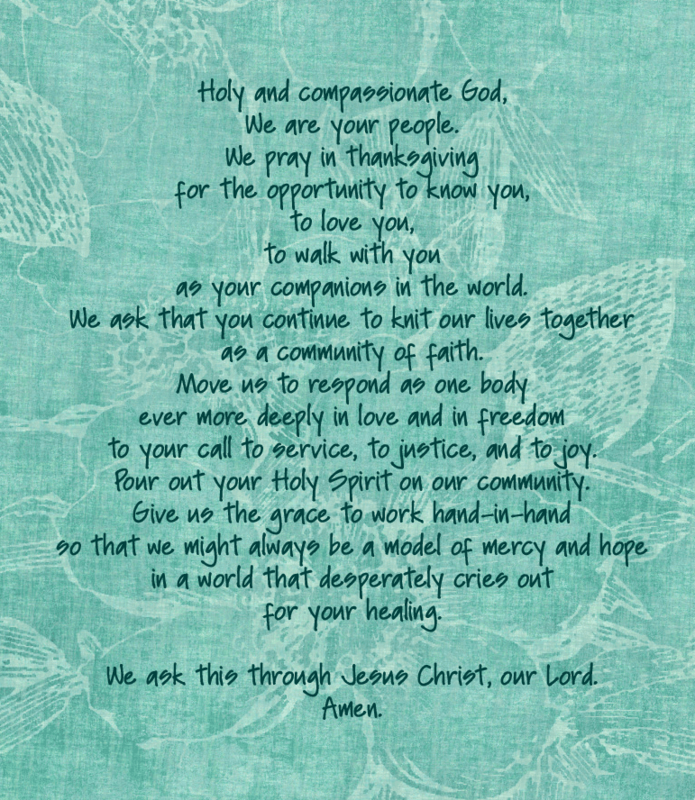 Please pray with our community the prayer posted to the left through the duration of this upcoming liturgical year. Let us join in one voice in supplication and humility to our God of infinite love and compassion--a God who desires to pour out God's grace upon us and make us collaborators in the bringing of salvation.